Greetings my friends and welcome! As I'm writing on this early October morning the sun has yet to rise, and what the day has in store is yet to be revealed. I'm certain of one thing. Fall has arrived in New England and with it the splendor of colors so rich and intense they simply take my breath away! The changing leaves are harbingers of the cold weather that will soon embrace us. What better way to prepare for the winter than by making a new wool hat in a deep rich autumn red? But how to pick a pattern? Last week I was fortunate to receive a "hot off the press" copy of the new e-Book, Accessories: Autumne 2012 from Denise at Voie de Vie. The Slouching Towards Tassels Cap caught my eye and seems like an excellent choice. An added bonus is a JAL over at Denise's group on Ravelry. Happiness all around!! As you can see, I've only just begun. My observations so far: I like that the ribbing is worked flat and then joined (it makes the fpdc and bpdc much easier! ); and I haven't worked with a "rough" wool like this for a while. I forgot how different it is from the "smooth" finishes I've been spending so much time with. It's not a bad thing, it just takes a different type of action to pull loops through. The soft peachy piece is the Marlo Cardigan that I started a few weeks (okay a month) ago. I'm a few inches from finished with the back panel. It's a beautiful fabric and I think it's going to be a nice sweater. Fit is my real concern. My experience is so limited with garments, that I really don't know what to do other than measure and follow the pattern. We'll see. John has been putting in some time making stitch markers this week. That's what the bit of sparkle on the red yarn is. He's refined his technique and they're coming out very nicely. Right now we're continuing to build quality stock. Our hope is to do a bit of the craft fair circuit next year as well as to open an Etsy shop. But that's a story for another day! Wednesday is book day, and you know how much I love books! This month I'm celebrating the Halloween season by reading (and listening to) titles of a spooky, supernatural nature! I just finished the book that's reviewed today and am poised to begin Crewel (Crewel World) by Gennifer Albin. This is YA title that was suggested to me by my coworker (the other Robin at our small library!) because of it's ties to weaving and fibers being worked together to form something new and different. It's quite a way outside of my normal reading choices, but seems appropriate and in keeping with my October theme. Time will tell, and I'll be sure to let you know! "My name is Elizabeth Anne Hawkesmith, and my age is three hundred and eighty-four years. Each new settlement asks for a new journal, and so this Book of Shadows begins...."
In the spring of 1628 young Bess Hawkesmith learns that decisions made in desperation carry consequences that last a life-time, even if that means forever. The plague has taken the lives of her father, brother and sister. When Bess falls ill her mother does the only thing she can to save her daughter. She turns to the warlock Gideon Masters, and makes a deal that will cost her her life. Once known as a talented healer she is accused of witchcraft by townsfolk who refuse to believe that Bess' miraculous recovery was the result of her skills alone. Unable to deny the accusation she meets her fate on the Hanging Tree, but not before making Bess promise that she will seek protection from the only one with the power to save her - Gideon. Under his guidance Bess learns to master the Craft, awakening powers she didn't know she had while also making her immortal. When the people of town turn their aggressions on Bess she realizes that she must escape - from the Hanging Tree and from Gideon and a his dangerous black magic. She couldn't know that he will persue her through time, determined to possess her and the power they could produce together. It seemed fitting to read a book about witches this Halloween. I was drawn into this story right off the bat, although I did struggle a bit with the prologue. I filled it away with the hopes that it would make sense by end (it did, mostly...). There was an easy flow between the past and present as I got to know Elizabeth and Tegan. The stories from the past were interesting little vignettes that were unique on their own, but fit together to create a picture of who present day Elizabeth really is. There is a fair amount of "magic speak" that was foreign to me. Even thought I didn't understand the exact language (or words) I was able to glean enough of their meaning from the context. I suppose that's to be expected in a book about witches and magic. There are scenes of pretty graphic violence and the descriptions of some of the evil elements and even Gideon himself are quite vivid, resulting in some intense imagery. I can imagine the special effects for a movie version would be very frightening indeed! I moved quickly through the book and in no time found myself nearing the end. I had in mind how I thought things might turn out, and I saw the potential for a variety of scenarios. And while I won't tell you how it all ended, I will tell you that I was disappointed. I felt gypped. It almost seems like Ms. Brackston just wanted to be done, and went with the most cliche ending while of course leaving plenty of threads that could be picked up in a sequel. Wednesdays are a busy day for sharing projects and making new friends! I'll be linking up with this lovely group of ladies. Each one has something uniquely wonderful to offer. I hope that you'll stop in for a visit, and feel free to join the fun! I am eager (and hesitant) to stretch and move outside of my blogging comfort zone. It is one of the main things that I'm hoping to achieve through participating in Blogtoberfest. And so, based on today's prompt I bravely share two poems I composed this morning. 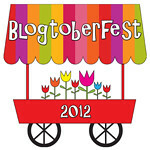 Today's post is part of Blogtoberfest. Click on the picture to find out more! I'm also linking up with Nicole who reminds us when things are crazy to Keep Calm and Craft On! Thanks so much for stopping by and spending a bit of your day with me. If you like the little pumpkin, check back later and I'll tell you all about it!